On Friday night, at the Kyle Gallagher (Fight Club) promoted event at the Devonshire House Hotel in Liverpool, the British & Irish Boxing Authority (BIBA) successfully sanctioned their inaugural event, since taking over the British and Irish operations of the Malta Boxing Commission (MBC) earlier this month. The first bout of the night, see Lee Clayton make his professional debut against two-bout veteran Thomas Murry. 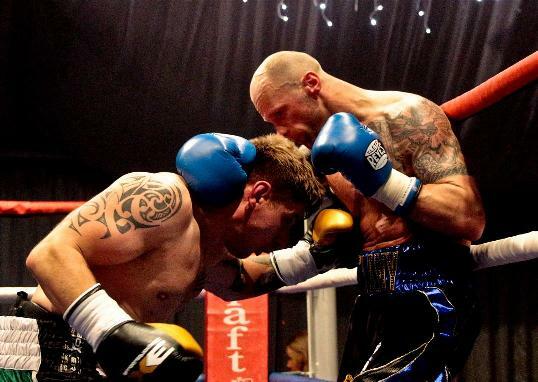 The two combatants went at it hammer and tongs from the off, both men vying for centre ring with a passion. As the round progressed into the second minute Clayton began to dominate, letting rip with vicious body shots whenever the opportunity arose. By the third minute Clayton stepped it up even further and then on around two minute thirty mark Clayton landed a peach of a body shot to send Murry down. 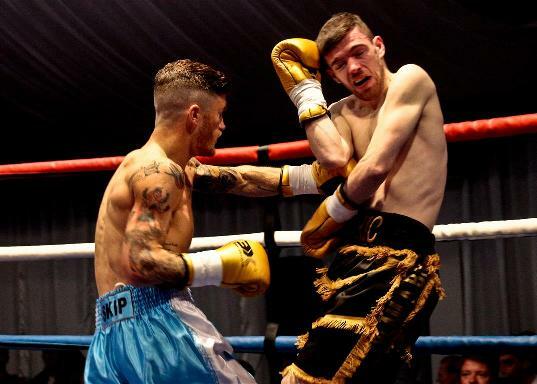 The Mancunian lad initially attempted to rise but was clearly in a lot of pain and motioned to Referee Jimmy Byrne that he couldn’t continue and the bout was waived off at the 2 minute and 42 second mark. 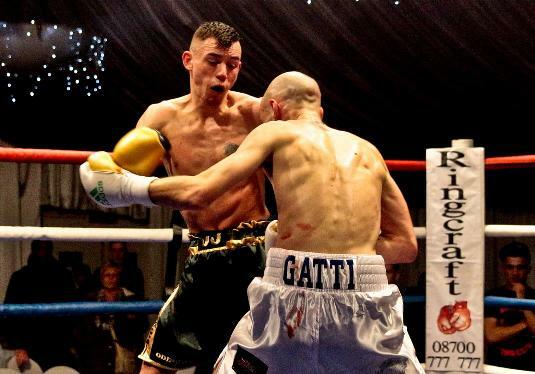 Local lad Dayle Gallagher faced Belfast’s Marty Kayes in the second bout of the night. From the opening bell right through to the closing bell of the bout these two warriors battled it out much to the delight of the packed house, after four very closely fought rounds Referee Jimmy Byrne scored the bout 40-36 in favour of Dayle Gallagher, whose record now stands as 2-0. Third bout of the night see Hyde, Cheshire’s Will O’Reilly make his professional debut against Newark, Nottingham’s Vaclav Skromach. Again another full on war from start to finish, both men giving their all for the full four rounds, as with the Clayton-Hayes bout each round was very close, in this case so close that Referee Jimmy Byrne scored the bout 39-37 in favour of debut kid Will O’Reilly. 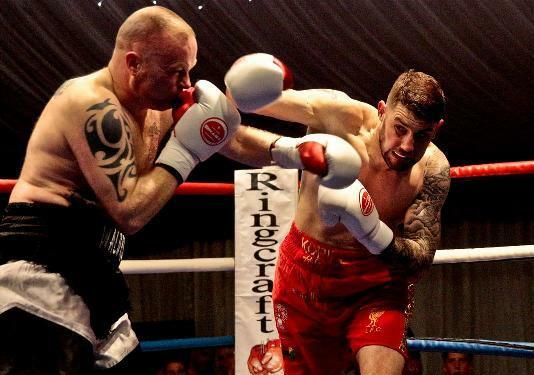 Next up see Liverpool’s Lee Boyce against Castlerae, Ireland’s John Waldron. Another cracking all action bout. Boyce dominated the majority of the first round, using his exceptional movement to keep the Irishman out of range, before moving forward and letting rip with clean sharp shots to body or head. 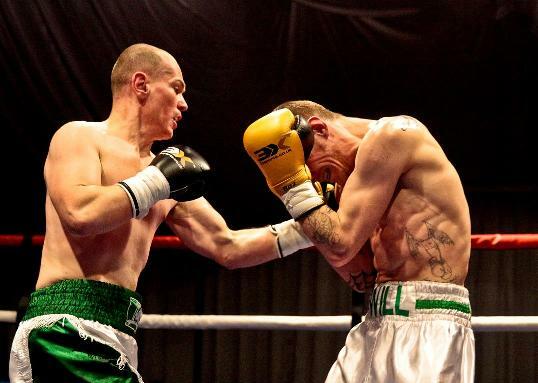 Many in attendance thought it was going to be an early finish, after Waldron was sent down following a vicious body shot in the first, but the Irishman is of much tougher stock, as proved in the second round which Waldron won. Third and fourth rounds were full on Battle Royales with Boyce capturing one and Waldron the other, so after four sensational rounds of boxing it was clearly going to be close, so no surprise that Referee Jimmy Byrne’s scorecards showed Boyce the victor by a very close 38-37, the first round knockdown being the difference. A seriously great fight and surely a rematch in the future should be on the cards. 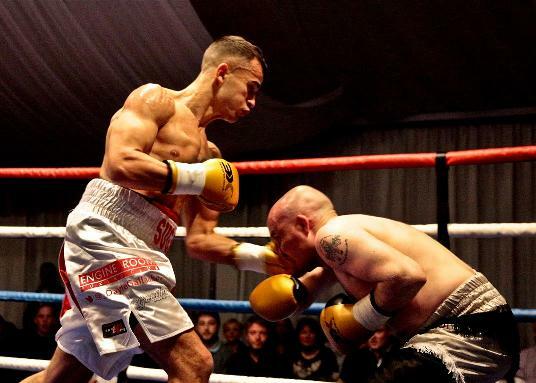 The fifth bout of the night saw former England Amateur star Nathan Russo making his debut against the equally talented and also debuting James McDonald. The first minute or so of the bout was sensational to put it mildly, first one lad dominated the other and then visa versa, however as the round progressed Russo began to get major success with vicious body-shots and big lefts to the head, so much so around the two minute thirty mark Russo stepped it up even further, forcing McDonald to cover up much more than he had in the early parts of the round, then just as the bell to end the round was about to be rung Russo let rip with a huge left to the head, sending McDonald straight down and out. Referee Jimmy Byrne realized the instant the punch landed it was a knockout and dived straight to the prone lads side to check his condition before signaling to the ringside medical team to enter the ring to attend to the injured warrior. The crowd stood respectfully quietly, as did Nathan Russo, as the medical team went to work on the prone McDonald, but when eventually McDonald was assisted to the stool some two or three minutes later the entire crowd to a man (or woman) stood and applauded. Although James McDonald seemed to be fully recovered, he was taken to hospital for checks to be on the safe side. The final bout of the night see local lad Jay Carney against pro debuting Jak Johnson, from Newcastle. Everyone was expecting this to be a serious good fight, as these two lads had fought each other previously in the amateurs, and they were to proved right. What a first round, these two really went for it, both lads boxing beautifully throughout. Early in the second Johnson began to take control, landing some pinpoint perfect shots, Carney though is as tough as they come and weathered the onslaught and as the round progressed fought back magnificently and began to regain control. Around the two minute thirty mark Carney stepped things up and started landing some big shots, causing Johnson to cover up, however this tactic opened up the body, which Carney took advantage of, throwing a huge body shot to send Johnson down. As with Thomas Murry, initially Johnson tried to rise but was too winded to do so. Referee Jimmy Byrne waived the fight off on the two minute forty five second mark of the second round. Following the event British & Irish Boxing Authority Vice President and CEO Gianluca Di Caro spoke briefly about the event. “We couldn’t have asked for a better event to launch the British & Irish Boxing Authority, Kyle (promoter Kyle Gallagher) had put together a fantastic show, he’s without doubt one of the UK’s best promoters, his attention to detail is first class. The venue was superb and the matching of the bouts was first class and more importantly, well to us, featured both British and Irish boxers, so we are over the moon he has chosen to be with the British & Irish Boxing Authority. I have nothing but praise for every single fighter tonight, every single one of them fought their hearts out and put on a great show. I am pleased to report that James McDonald is fine, but have to admit I was worried as it looked quite serious at the time, and to be honest if it wasn’t for the quick reactions of Jimmy (Referee Jimmy Byrne), John (Dr John Oates) and Chris (Trauma Medic Chris Say) and his team it could so easily have been. The British & Irish Boxing Authority is a professional boxing Governing, Sanctioning and Licensing organisation that operates primarily within the United Kingdom and the Republic of Ireland. The British & Irish Boxing Authority (BIBA) has affiliation with many World Boxing Championship organisations, a number of regional Championship organisations as well as operates both National and International Championships, within the United Kingdom and Republic of Ireland, under the BIBA banner. As such we at the British & Irish Boxing Authority are determined to do our utmost best for BIBA licensed professional boxers, whether they are just starting their career or are battle hardened veterans. The British & Irish Boxing Authority’s primary focus – besides the licensing of professional boxers and their coaching, management and promotional agents, sanctioning of professional boxing events, as well as the training and licensing of officials – is the raising of medical protection standards for the sport, to ensure that the health and safety of the young men and women that participate in the sport, as well as the application of the Association Of Boxing Commissions (ABC) Unified Rules and Regulations for Professional Boxing events. The Executive Committee of the British & Irish Boxing Authority (BIBA) comprises of some of the most respected people within boxing, each dedicated to ensuring the health and safety of their license holders and boxers that compete on events sanctioned by the BIBA.